Generally visits occur Monday through Friday 6-8 p.m. , Saturday 9:00a.m.-11:45 a.m. and 1:00 to 4:45 p.m, and on Sunday from 9:00a.m.-11:45, 3:00p.m.-5:00p.m. Parents and legal guardians are allowed to visit. Juveniles may also have visitation with Legal Attorneys' and Clergy. All other visitors must be approved by the Facility Director or Designee, and the juveniles' Juvenile Probation Officer prior to being allowed visitation. Visitors are required to phone 5-C to schedule a visitation appointment in advance. Authorized visitors must present valid photo identification. Authorized visitors must be 18 years of age or older. Any resident has the right to refuse visitation. Authorized visitors are not permitted to give the residents any items. Purses, backpacks, satchels, keys and such should be left in the car or secured in a locker in the waiting area before visitation. Visitors are not allowed to bring any type of contraband into the facility. Examples include pocket knives, tobacco, lighters or matches into the facility. 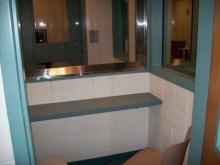 Five County Detention is a smoke free, drug free workplace. Authorized visitors are subject to search. Authorized visitors must be properly attired. Any person in indecent or inappropriate clothing will be asked to leave. Authorized visitors that appear to the staff to be intoxicated or otherwise not in control of his or her behavior will not be allowed to visit. To ensure visit availability for all residents, visits are limited to 30-minute sessions with a total of 2 hours visitation per week.